Building 4 / 460-492 Beaudesert Road, Salisbury Queensland 4107, Australia. Opening Hours : 8.30 am – 6:00 pm, (AEST) Monday to Friday. Building 3 / 92 Mallard Way, Cannington, Western Australia 6107, Australia. Opening Hours : 7:30 am – 4:00 pm (AWST) Monday to Thursday. 7:30 am – 3:00pm (AWST) Friday. As passionate vegan protestors cause havoc in Australias’ cities and farms over animal rights, social media’s response to the campaigns has been unsurprisingly savage. The following article published by news.com.au goes into detail on the chaos of the protests and some of the most controversial responses twitter has to offer. As a mass wave of vegan protests hit around the country today, meat-loving Australians have reacted savagely to their demands social media. Trolls on Twitter are posting pictures of bacon and steaks and threatening to eat a Big Mac for every minute they are delayed by the ongoing protests around Australia. One commenter said he was planning to have a salad for lunch, but because of the protests this morning he decided to have a juicy beef burger, with extra bacon, instead. Satirical news website, The Betoota Advocate, trolled animal activists, penning a piece titled: “Melbourne’s Vegan Protests Lose Momentum As Activists Begin Napping Due To Iron Deficiencies”. “What started as a passionate and peaceful protest against the structurally discrimination faced by livestock at the hands of society that believes in the concept of an animal kingdom, has gradually started to fizzle out – as the animals rights protesters sporadically begin to have naps in the middle of the street,” the comedy website wrote. Speaking to reporters this morning, he hit out at protesters for targeting drought or flood-affected farmers who were “going through some of the hardest conditions we have seen in this country for more than a century”. “I also say this, if there are pastoralists, farmers, graziers that are in a position to bring a civil action against these groups, looking to undermine their livelihood, the Commonwealth is totally open to supporting them in a test case to show these green criminals,” Mr Morrison said. Earlier, he called the activists “un-Australian”. “It is shameful, it is un-Australian,” Mr Morrison told 2GB radio. Despite a sarcastic response from many Australians, organiser and director of animal rights documentary, Dominion, Chris Delforce, said there’s a very serious message behind today’s protests. “The industry is telling people these animals are being killed ethically, that they are being killed humanely — the reality is … it’s the furthest thing from humane,” Mr Delforce told AAP. He laughed off Prime Minister Scott Morrison’s suggestion the protests occurring across the country were “un-Australian”. “I think most Australians are opposed to animal cruelty,” he said. However, it’s clear from social media not everyone is in support of today’s protests. As part of the activism, Melbourne’s busiest intersection has been blocked off by vegans conducting a “peaceful” peak-hour protest. Hundreds of vegans from all over Victoria gathered at 5.30am outside Flinders Street Station, holding signs and blocking cars and trams from passing through. Police have arrested nine people at an abattoir in the NSW Southern Tablelands. Wearing T-shirts emblazoned with animal rights slogans, the group chained themselves to a conveyor at the premises at about 2.30am before refusing to leave, according to police. Police have also broken up a protest at a Queensland abattoir. About 20 animal rights campaigners descended on the Warwick abattoir and chained themselves to equipment before police were called to remove them. Hey @VictoriaPolice – Will the #vegan protesters be sent a bill for the cost of breaking up their stunt? Or will the commuters disrupted by it foot the bill a la Milo Yiannopolous? It’s all part of a national day of organised vegan activism that is being touted as the “biggest animal rights protest the world has ever seen”. And, despite the loud criticism and predictable posting of bacon and steak pictures on social media, some Twitter users said those inconvenienced by the protest need to get over themselves. 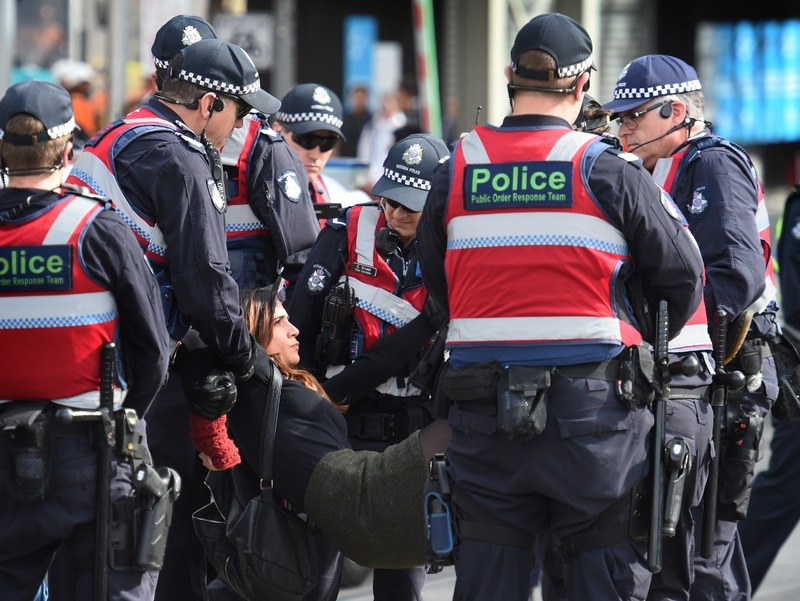 Police move in to remove vegan protestors who had been blocking the intersection of Flinders and Swanston Street Melbourne in support of animal rights. Fast track your experience recognition today. Start now.